Japanese art inspired the bag-like shape and fish and waterweed decoration of this vase. The designer, François-Eugène Rousseau, inherited a shop in Paris that sold glass and ceramics. He began to design glass around 1867. At this time he was one of the first to welcome Japanese influence both in his own pieces and work he commissioned from other artists. Most of his designs were made by Appert Frères at Clichy. This vase was shown in the International Exhibition, Paris, in 1878. 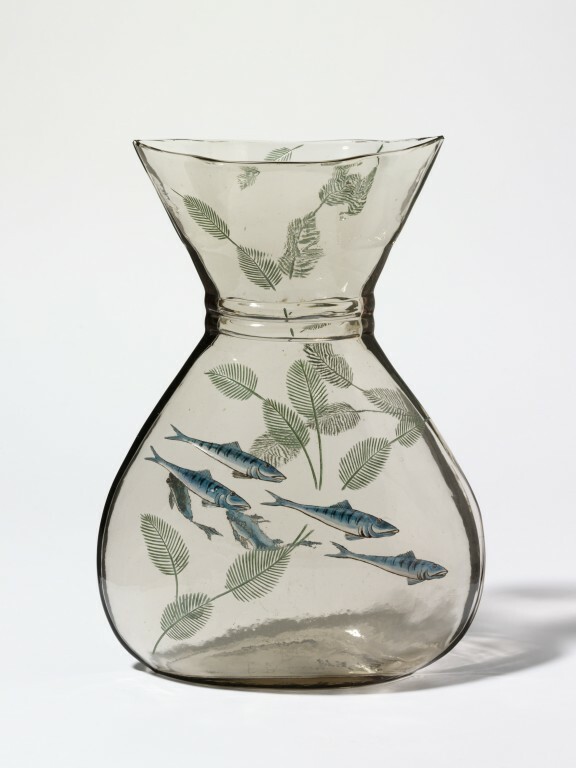 Conceived as one of a pair (the other being 673A-1878), this vase is a loose flattened shape with blue glass applied to appear like running droplets of water and the witty, yet graceful decoration of fishes swimming under a clear surface on which is engraved floating water weeds. It is directly influenced by similar effects used in Japanese pottery. Rousseau inherited a shop in Paris selling fine ceramics and glass. When he began to design glass himself around 1867, he as particularly interested in Japanese art. 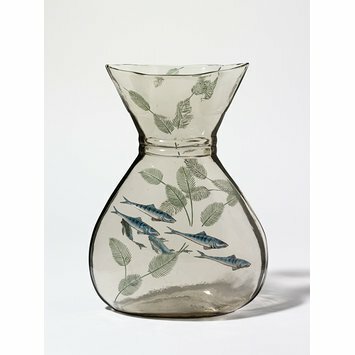 The shapes of the vases, and the idea of fish swimming beneath the water weeds, are both Japanese in inspiration.